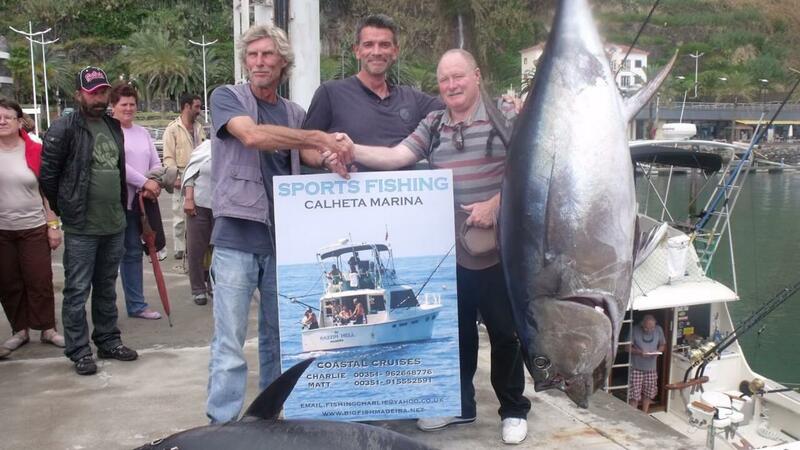 I have 14 years experience big game fishing in Madeira Island with blue marlin, white marlin, big eye yellow fin and blue fin tuna, and light tackle fishing for wahoo, snappers, barracudas, dorados and many other species. With our 45ft boat `Razzin Hell´ and our light tackle boat, a 19ft Boston whaler called `Mako´. We are a fully legal charter company with the compulsory `MT´ Portuguese Charter license. We always do our very best to catch you that fish of a lifetime. We are trolling for big game fish, blue and white marlin, big eye and yellow fin tuna , blue fin tuna, dorados, wahoo, barracudas, blue fish, and many other species, we use shimano tiagra 130 lbs , penn 130/80 lbs and 30/50 lbs tackle for smaller species. As the water is very deep here fishing begins immediately outside Calheta marina, we are trolling at around 8 knots. We always give a full safety briefing and a run down of all the fishing gear before we leave the marina, its safety first at all times. 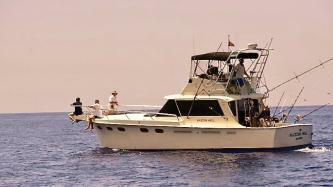 Our 45ft boat has loads of space to relax in or out of the sun, and a very comfortable lounge and fly bridge. Anyone who is not fishing can relax or sunbathe on the large from deck. We have a great `Fusion´bluetooth stereo onboard so you can listen to your favourite music. There is a proper bathroom below and a full size galley. We always do our very best to make it a trip to remember. We have landed some huge fish since arriving back in 2004. We are a very experienced and fully qualified British crew. We also hold all the correct local charter licenses and insurances and all the correct safety kit. We display the Portuguese compulsory `MT´ license.